Today was my 47th birthday. 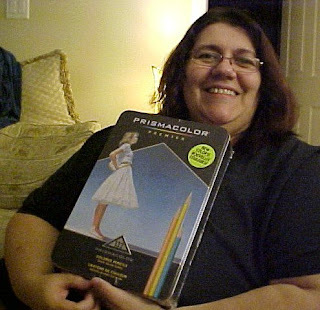 In the photo above, you see me with the gift my husband and son gave me, a 132 count Prismacolor set of coloured pencils, with Ann Kullberg's painting on the front of the tin. I was absolutely thrilled to get this. This morning my friend, Laura, and her mother, Beverley, called and sang Happy Birthday to me. That was so nice. 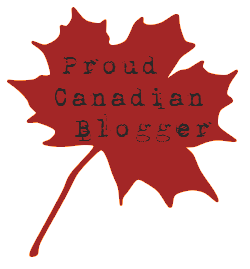 I also got a call from my Godmother Laurinda and my Aunt Olimpia (both in St. Catharines, Ontario), a call from my mother, and a brief visit from my brother, Emilio (the computer genius). My friend, Jill Hammond, came by at noon today, and spent the day with me. She brought me a lovely ceramic cockatiel statuette. I have to still photograph it and will upload it at another date. It is beautiful. We had a great visit. It had been a long while since we had a face to face visit. She is the beautiful red-head that I did a portrait of earlier. She is concerned that she has put on some weight, but I think she looks more beautiful than ever. The weight suits her and makes her sensuous and curvy. 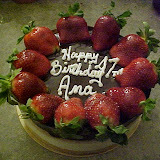 When we arrived home, we had some strawberry Boston cream cake, coffee, and opening of gift. All in all, it was a wonderful birthday. Click on picture below to see more photos. I have also finished a black and white commissioned portrait for a 1st anniversary. I will not be able to post it until after the gift is received by the recipients because I do not want to spoil the surprise. I will share it here as soon as they get it. I am working on a portrait of a little boy next, plus I have some other ideas to do, and Jill has asked me to do a portrait for a friend of hers. Girrrll, that cake looks goooood! I wish I knew who wrote the above note. It made me laugh. Happy Birthday Ana! Wow, with all those projects lined up you are going to be a very busy gal! You go girl!! Happy Birthday, Ana! Looks like a fabulous day! My daughter's is tomorrow the 21st. Looking forward to the art you will create with your gift. Happy Birthday, and thank you for your comment. I discovered Prismacolor - finally available in the UK. Wow. You've got yourself some colour range there! Congrats! ps. I love your drawing of the virtual orange.